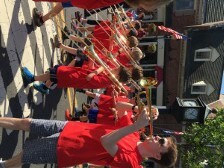 At the annual Town Memorial Day Parade on Monday, May 25, the Haddonfield elementary and middle school “Band Buddies” joined the HMHS Marching Colonials for their second Memorial Day parade. Band Buddies is a program started three years ago by elementary music and band teacher, Mike Hecker. Band Buddies range from fourth through eighth grade and play along side the mentor high school band members at parades and one football game each season. This is the eighth Band Buddies event and largest yet, with 45 Band Buddies in attendance on Monday. Enthusiasm and camaraderie are contagious, and each event brings out more and more kids! The kids enjoyed root beer floats in the HMHS band room following this fun and lively event.